Ouija board consist of a small board on which numbers and letters are written. At the top of the board are written the words Yes, No and Goodbye. The board is written in a language understandable to the local people. There is a disc or pointer in the middle of the board and the edges of which are held by a minimum of two people or players. 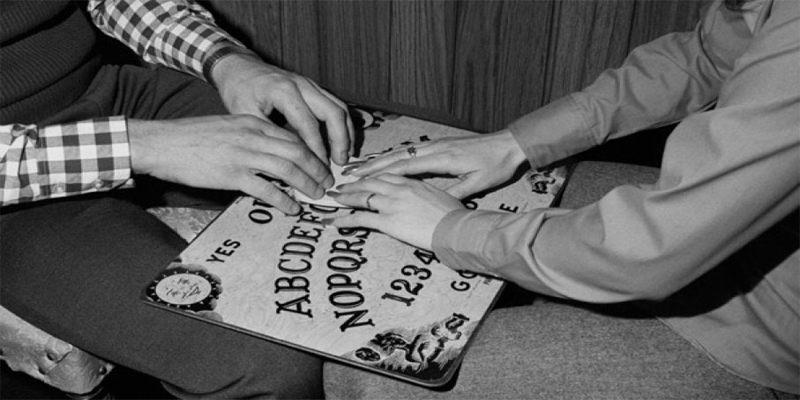 The game begins by calling upon ouija and it is very clear in the minds of players that they are calling the spirit or a jinn according to the belief of the player. When the players ascertain that the spirit is around them, they begin asking the question or events that are unknown to them. The disc moves towards the numbers and letters in order to spell out the answer. If the question is about a specific date, the disc, with their fingers on it, moves towards the numbers in order to answer the question. Similarly, if the question is about a name or an event, then the disc moves towards the letters in order to spell out the answer to the question. Or the answer may be Yes or No, so the disc moves towards one of them. These players cannot exit the game unless they are given permission by the ouija, if the disc moves towards no then they cannot leave the game and if it moves towards yes, players have to thank him and then they can leave and the disc then moves to goodbye. Some people take this game lightly and try to make fun of it but in fact, it is extremely serious. What appears to be the case is that the word “Ouija” is the name of one of the jinn – a king or someone else– and he sends one of his troops to move the disk towards the numbers and letters to spell out the answers. Some people are of the belief that this movement comes from the devils around the person or devil companions of the person playing this game and that what they ask about is known to them only or is known in the realm of the jinn. Islamically speaking this ouija board game poses a great danger to the religious commitment and life of the player. Regarding the person's religious commitment, it involves calling upon someone other than Allah. It means responding to them and believing in them. It means that a person believes their word and believing that going against their order can harm them. It means disbelief in Allah. Playing this game is no different than going to a soothsayer or fortune teller, because of what happens of the player asking the jinn about matters that are unseen or unknown to him. The danger to the life of the player includes anxiety, fear and mental illnesses that ruined their lives as is widely known. Hence there have been many statements from psychologists and there is unanimous agreement on the necessity of getting rid of this game and not trying it out, let alone playing it and becoming attached to it. What is established in the mind of the Muslim is that the Prophet (blessings and peace of Allah be upon him) forbade going to soothsayers and said that “they are nothing.” And he said that if a person goes to them, even if he does not believe in them, then no prayer will be accepted from him for forty days, and that whoever goes to them and believes in them has committed an act of disbelief. For a Muslim it is inacceptable for him to go to the soothsayer or fortune teller or seek the assistance of the jinn to find the answers of the unseen. Even if the person claims that he is not worshiping them or is not in obedience to them. Merely seeking their help is prohibited. Because the jinn benefit from the humans who play this game, the jinn submit, in a sense, to the players, by telling them the unknown matters they ask about. The human also submits to the jinn in a sense. It is sufficient to note that they dare not leave the game without seeking the permission of “Ouija”, otherwise they think and believe that they will be harmed. Allah, may He be exalted, says (interpretation of the meaning): “And on the Day when He will gather them (all) together (and say): ‘O you assembly of jinns! Many did you mislead of men,’ and their Auliya (friends and helpers, etc.) amongst men will say: ‘Our Lord! We benefited one from the other, but now we have reached our appointed term which You did appoint for us’” [al-An‘aam 6:128]. The sin and disbelief that affect the player before and during the game, and afterwards, is what Allah, may He be exalted, mentions in the verse (interpretation of the meaning): “And verily, there were men among mankind who took shelter with the masculine among the jinns, but they (jinns) increased them (mankind) in sin and disbelief” [al-Jinn 72:6]. Hence it is haram for a Muslim to play this game and be attached to it. One may argue that they will be safe and that nothing can harm them or that it is just a game may understand that it involves calling upon someone other than Allah which alone is sufficient to abandon it. Apart from that it is harmful and can be the cause of various problems. It is better to stay away form it. Nice Article, Keep up the good work.